Promotional Custom Printed Micro Fibre cleaning cloths are great way to clean away the dust and finger prints off your Laptop, Camera, MP3 Player, Sunnies and even your Mobile Phone screen! Funky promo ideas such as Micro Fiber Sunglass Pouches and Lens Cloth Key Tags are now availablewhich make a handy travel accessory. 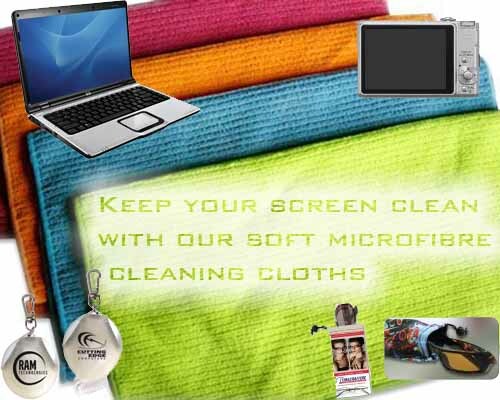 Micro Fiber Laptop Screen Protector, Micro Fiber Camera/ Cell Phone Pouch and MicrofibreCloths come in Mini Micro Fiber Cloth (138.11mm x 138.11mm), Micro Fiber Cloth (Medium 304.8mm x 203.2mm) and Large Micro Fiber Cloth (177.8 mm x 196.85 mm) to accommodate your needs. The Microfiber material will protect your product against scratching of the surface. Printed Microfiber Cleaning Cloths can be used to safely clean off excess dust and dirt left by touching the screen with excellent oil and perspiration absorption with no sprays or chemicals needed. Full Colour/ 4 Colour process printing is available at great prices to suit any budget. Microfiber Cloths are crafted from a new polyester fiber that is extremely fine and closely duplicates the look and feel of natural fibers. Measuring finer than silk, these cloths are the finest manmade materials ever produced!